Our baby is just about 8 months old now and loves to feed herself. (I think we may need to check her into a Cheerios rehab center soon.) One problem she has is trying to pick up small pieces of slippery, wet fruit or veggie, like pears, bananas, avocado, carrots, etc.–she can’t get a good enough grip on them to get them off of the high chair tray. 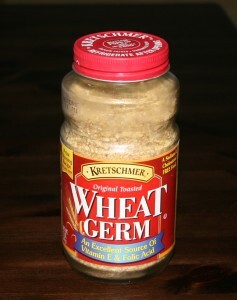 We’ve found that if we toss the food pieces in wheat germ to coat them, she can pick them up without a problem. Even better, she gets some additional nutrition from the wheat germ. I suppose you could also use something like the dried baby cereal mix or even crushed up Cheerios, though we probably should feed the addition more than we already are. Be ready, though, for a nice mess to clean up afterwards, since wheat germ and banana slime seem to create a nice glue that, for our baby at least, ends up coating her face. I’m taking a trip to Sweden soon. In honor of that (and by request of Jana), here’s a recipe for some homemade aquavit. I first saw this made on PBS on New Scandinavian Cooking, and then again in that show’s Norwegian host Andrea Viestad’s book, Kitchen of Light. It’s an aquired taste, at least for an American, but I like it. Add the spices to the vodka bottle and cover tightly. Let it stand for 2 or 3 weeks, depending on how strong you want it to be. Shake the bottle occasionally. Once it’s reached the desired flavor, strain it and return to the bottle. Our backyard apple tree is dropping apples like crazy, much faster than I can eat them by hand. Too many of them are already being wasted, sitting on the ground for days, so I decided to do something about it: make applesauce. Here’s what I did, based on a recipe at Simply Recipes. Peel, core, and quarter the apples. Put them in a pot large enough to hold them with some extra room. Add the rest of the ingredients. Cover the pot and bring to a boil. Once boiling, reduce the heat and simmer for 25 minutes. 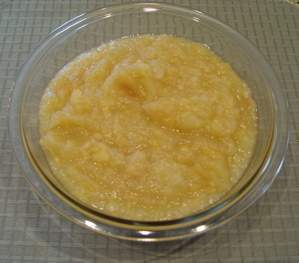 Remove from heat and mash with potato masher or, for a smoother applesauce, use a food processor. 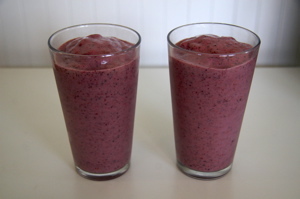 Allow to cool a bit and either serve immediately warm or refrigerate or freeze. With the gracious help of Amazon.com, I’ve set up the Throwing Food Store, featuring great cookbooks, kitchen gadgets, and food that I mention on this site. Check it out if you have a second. In a totally offtopic comment on Slashdot, an anonymous poster provided this recipe. It sounded pretty good, so maybe I’ll give it a try. Prepare barbecue (medium-high heat). Sprinkle skirt steak on both sides with salt and 1 1/4 teaspoons chile powder. Whisk 1 1/2 tablespoons olive oil and 1 tablespoon lime juice in 11×7-inch glass dish. Add meat and turn to coat; place in single layer. Marinate 15 minutes. Meanwhile, brush green onions and corn with 1 tablespoon oil and sprinkle with salt and pepper. Grill vegetables until slightly charred, turning occasionally, about 2 minutes for green onions and 7 minutes for corn. Working over bowl, cut corn from cob directly into bowl. Coarsely chop green onions and add to corn. Stir in cilantro, lime peel, and remaining 1/4 teaspoon chile powder, 1/2 tablespoon oil, and 1 tablespoon lime juice. Season relish to taste with salt and pepper. Grill skirt steak to desired doneness, about 2 1/2 minutes per side for medium. Transfer to work surface; let rest 5 minutes. Place tortillas at edge of grill to warm and soften, about 1 minute. Arrange 2 warm tortillas on each of 4 plates. Thinly slice skirt steak across grain. Divide skirt steak and juices equally among tortillas. Spoon relish over each and serve. The sun poked through the rain clouds this weekend, so we got in the mood for some lighter, summery fare. I dug through our recipe folder and found a couscous salad that was based on something from a Naked Chef episode we saw years ago. It’s great served in pita. On your grill or a grill pan, lightly char the asparagus and zucchini. Roughly chop. Also roughly chop or tear the herbs and place the red peppers, zucchini, chile peppers, green onions, and herbs into the large bowl with the couscous. Mix well. In a small bowl, mix the lemon juice, olive oil, and 1 tablespoon each of the salt and freshly ground black pepper. Add to the salad and toss well. Taste and season with additional salt and pepper and sprinkle with red wine vinegar until it’s tangy enough to suit your palate. 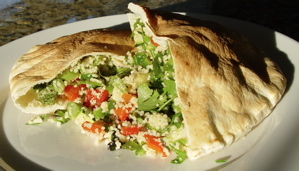 Serve as a side dish or stuff inside pita bread as a main dish. 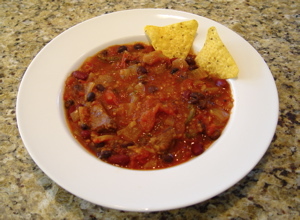 As mentioned in the post about my Le Cruset cast-iron pot, I’ve got a chili recipe that Carol and I really enjoy. It’s somewhat based on a recipe I found on All Recipes a few years ago, but I’ve modified it a bit, replacing the ground beef with nicely browned stew beef and adding a few other things here and there. If you’ve got a few hours free on a Saturday or Sunday, give this one a try! Trim the beef of any unpleasant looking fat and silverskin. Sprinkle it generously with salt and pepper. Add 2 tablespoons of vegetable oil to a heavy stew pot over medium high heat. You’ll want to be sure to turn on your stove hood to high now, if you can, and get out your splatter gaurd, if you have one. Browning the meat can get very messy. Once the oil begins to shimmer, add the beef, piece by piece until you have a uncrowded single layer of beef. Allow the beef to sit for a few minutes until the side that’s facing down is dark brown, but not burned. Turn the beef and brown a second side of each piece. Remove the beef to a bowl and brown the remaining beef in similar batches, adding a little more oil between batches, if needed. With the beef removed from the pot, turn the heat down to medium and add another tablespoon or two of oil, if needed. Add the onions and a big pinch of salt. As the onions cook, stir occasionally to scrape up the brown, beefy goodness from the bottom of the pot (a.k.a., the fond). Once the onion starts turning translucent, add the chile peppers and garlic, and cook for a few more minutes until the onions are soft. Pour in the tomatoes and their liquid, breaking up the whole tomatoes with your fingers. (You could chop them prior to adding them, if you’d like to keep your fingers clean). Fill one of the empty tomato cans with water and add to the pot, to raise the liquid level a bit. Add another big pinch of salt and the black pepper, cumin, chili powder, paprika, oregano, cinnamon stick, and cloves. Bring to a boil and reduce the heat to medium low. Cover and simmer for 45 minutes. Stir in the beans and crushed tortilla chips and cook for another 20 minutes. Remove the cinnamon stick before serving. Avocados on sale at the grocery store, a few extra slices of bacon from our salmon chowder, and some leftover bread can mean only one thing: bacon avocado sandwiches. 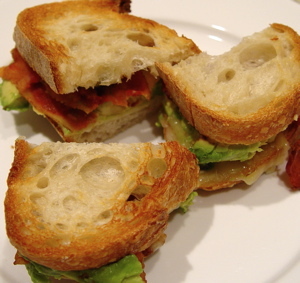 Make a couple of sandwiches, layering the bacon, avocado, and cheese. Eat and enjoy!